Wisdom teeth present potential problems when they are misaligned they can position themselves horizontally, be angled toward or away from the second molars or be angled inward or outward. 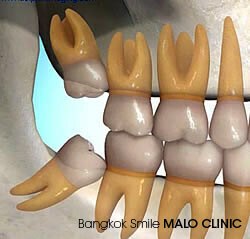 Poor alignment of wisdom teeth can crowd or damage adjacent teeth, the jawbone, or nerves. Wisdom teeth that lean toward the second molars make those teeth more vulnerable to decay by entrapping plaque and debris. In addition, wisdom teeth can be entrapped completely within the soft tissue and/or the jawbone or only partially break through or erupt through the gum. Teeth that remain partially or completely entrapped within the soft tissue and /or the jawbone are termed “impacted.” Wisdom teeth that only partially erupt allows for an opening for bacteria to enter around the tooth and cause an infection, which results in pain, swelling, jaw stiffness, and general illness. Partially erupted teeth are also more prone to tooth decay and gum disease because their hard-to-reach location and awkward positioning makes brushing and flossing difficult. In addition, wisdom teeth can be entrapped completely within the soft tissue and/or the jawbone or only partially break through or erupt through the gum. The relative ease at which your dentist or oral surgeon can extract your wisdom teeth depends on the position of the impacted teeth. Your oral health care provider will be able to give you an idea of what to expect during your pre-extraction examination. A wisdom tooth that is fully erupted through the gum can be extracted as easily as any other tooth. However, a wisdom tooth that is underneath the gums and embedded in the jawbone will require an incision into the gums and then removal of the portion of bone that lies over the tooth. Oftentimes for a tooth in this situation, the tooth will be extracted in small sections rather than removed in one piece to minimize the amount of bone that needs to be removed to get the tooth out. What does recovery from the procedure involves? Bleeding may occur for several hours after tooth extraction. To control it, position a piece of clean moist gauze over the empty tooth socket and bite down firmly. Apply constant pressure for about 45 minutes. A moistened tea bag is an effective alternative. The tannic acid in tea helps healing blood clots to form (blood clots function similarly to a scab on an open wound). Repeat this process if a small degree of bleeding continues; if heavy bleeding continues to occur, contact your dentist or oral surgeon. Avoid rinsing or spitting for 24 hours after tooth extraction, avoid "sucking" actions (for example, don't drink beverages through straws or smoke) and avoid hot liquids (such as coffee or soup). These activities can dislodge the clot, causing dry socket (see below) to develop. DO apply pressure to stop the bleeding by placing the gauze directly over the extraction site, and if bleeding persists please call our office. DO place cold packs on area 20 minutes on and 20 minutes off for the first 6 to 8 hrs, in case of any swelling. DO eat only soft foods for the first few days, nothing grainy like nuts or popcorn. DO take antibiotics or pain-reducing medication if prescribed. DON’T chew hard or crunchy foods such as nuts or popcorn for 2 weeks. These foods could become lodged in the extraction site or fracture the weakened jawbone. DON’T smoke right after surgery. Inhaling creates suction and it could loosen the blood clot. DON’T rinse for the first 24 hrs. After 24 hrs., you can gently rinse for the next few days to avoid loosening the blood clot.